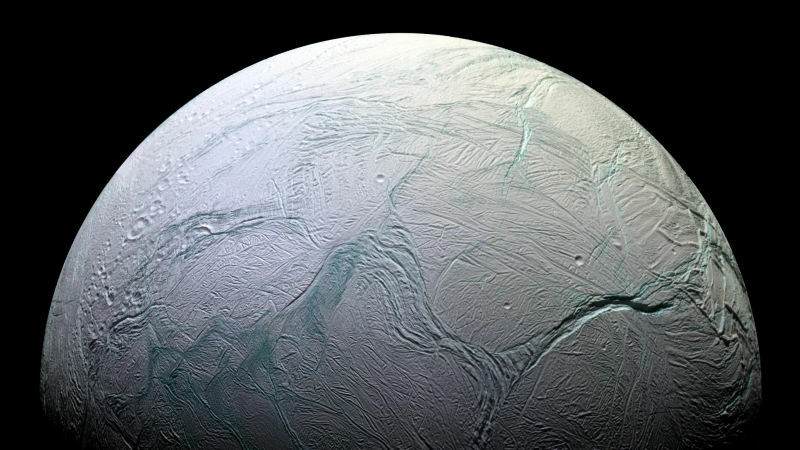 Saturn’s moon Enceladus features a warm subterranean ocean covered in ice. In an extraordinary new finding, scientists have confirmed the existence of a chemical energy source within this moon’s water that’s capable of sustaining living organisms here on Earth. Enceladus is now officially the best place beyond Earth to look for life. Molecular hydrogen is being produced in the ocean of Enceladus, according to a new study published today in Science. The most plausible source of this hydrogen is hydrothermal reactions between hot rocks and water in the ocean beneath the moon’s icy surface. So in addition to warm water, organic molecules, and certain minerals, this moon is also producing an accessible source of energy that could conceivably support alien microbes. Indeed, hydrothermal processes near volcanic vents are known to sustain complex ecosystems here on Earth. The new study marks an important development in our ability to assess the habitability of distant celestial objects, while setting the stage for future missions. Hopefully, we are going to do future missions. But the way things are going, the “we” is a global “we” instead of an American “we”, since there’s an anti-science pathology in the pigmy fingered pinhead’s administration.